Free shipping . See item details below for sale terms. Here is another pair of earrings from my “Grapevine” earring line. I’ve mixed my genres a bit and I think you’ll like it! The combo of elegant, cubic zircon teardrops with beachy turquoise glass beads, black Swarovski crystals, rustic mini mixed metal beads (my signature!) and much more all woven into a random, wabi-sabi, boho design, which crawls up like a grapevine on sterling silver wire. 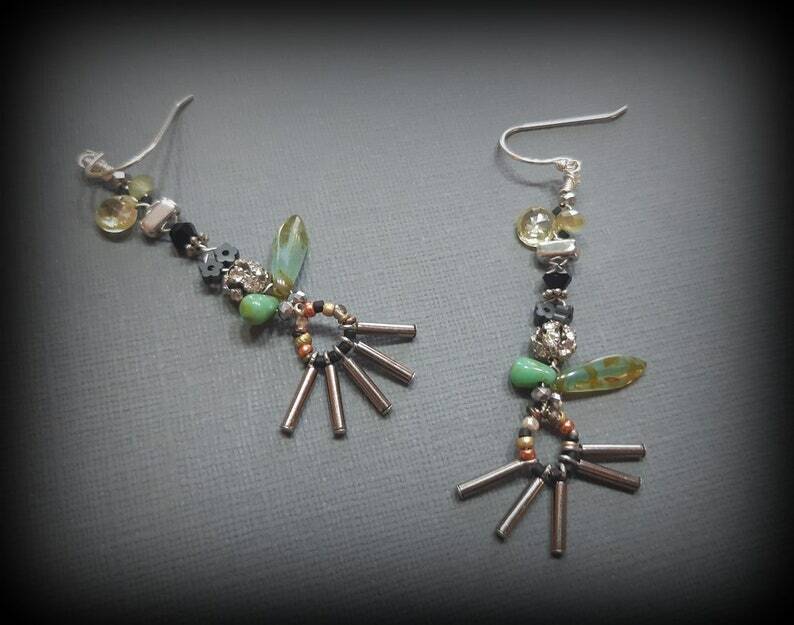 These earrings are earthy and casual but make a cool statement and WILL get noticed! The earrings hang from sterling silver ear wires and will hang about 3” (7.6 cm) from the hole in your lovely ear. They can be kept locked in place with rubber stoppers (not pictured but included). If you prefer hoops and circles hanging from your ears. . . .
Love this item but want to buy later? Click the heart ♥ to save as a “Favorite". Why not “Pin” it on Pinterest?! Questions? Click here and ask away! © dorijenn 2008 - 2019. All images and designs are the intellectual property of dorijenn. All rights reserved. Free Worldwide Shipping - Limited Time Only!